Helium filled balloons have the magic ability to delight us. Helium balloons and Helium balloon bouquets are the perfect way to add colour, theme and fun to the party venue. Whether you want to draw attention to the entrance, the dance floor, the stage or the cake table or the banquet table, helium balloons add colour and movement within the venue. Helium filled foil balloons in your child's favorite character like Cinderella add to the theme party atmosphere. Kids love helium balloons and they appeal to adults as well! Helium is a light gas that often used to fill balloons to make them float or fly. WHY DO PEOPLE IN INDIA STILL USE HYDROGEN GAS TO MAKE THE BALLOONS FLOAT? Many in India, use the highly flammable and explosive Hydrogen Gas 1) First and foremost , because it costs very less. Hydrogen is abundant on Earth and hence cheaper whereas Helium is rare on earth and hence is very expensive. 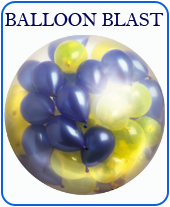 2) due to lack of awareness of Hydrogen Gas's impending danger 3) some among the users who think they are 'wise' assume that, though hydrogen is flammable and explosive , the hydrogen filled balloons that they use in "their" party, may not explode, ha ha! One of the users, when pointed out the risk, said this to us " we have used Hydrogen in our last year party and nothing happened!" Well, what can we say? 4) Its funny when some others think they can take extra care to prevent any untoward accidents. How wrong they are! Please read further to know more 5) Unfortunately , in many Cities across India, including Bangalore, Chennai, Hyderabad, Delhi, Mumbai, Kolkata - many reputed party suppliers, event managers and balloon decorators still use the dangerous, explosive and flammable Hydrogen gas. While the cutomers trust them thinking they use only Helium, these event managers let them down. IS HELIUM FLAMMABLE? The answer is simply, no. Helium is an inert gas. Inert quite literally means non-combustible. To get back to the main point, why is helium gas so often mistaken as flammable? So what was in these balloons that exploded? Those balloons in the link above certainly exploded and people certainly were hurt. Because the actual gas inside was hydrogen. Never use Hydrogen gas in balloons. We use Helium Gas that comes with 99.995% Purity certification. We also use safe and certified Helium Helium cylinder regulators to fill the balloons like the world-renowned balloon decoration equipment manufacturer Conwin, USA . We follow all smart balloon practices and guidelines for safety. Now buy your helium balloons from Bubbly Balloons, the helium experts and your “helium balloons” are never going to burst into flames. Call us today at 98942 98924 and let us bring the magic of helium balloons to your next occasion!